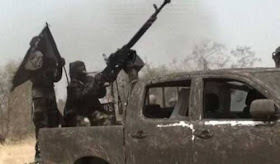 Boko Haram terrorist have launched a daring attack to enter Maiduguri, the Borno State capital. Residents said the insurgents are in a heavy exchange of fire from Molai village along Damboa Biu road. Aliyu a staff of NTA Maiduguri informed that they have been stocked in the office as all access roads have been blocked by security. Another resident who spoke from a heavy hold up in town said they have been locked down by traffic as many residents are hurriedly going home. So far, details of the attack are still sketchy. The army in Maiduguri has however called on the residents of Maiduguri to remain indoors and not panic. Colonel Kingsley Samuel, Deputy Director Army Public Relations in a statement made available to newsmen in Maiduguri assured that the situation is under control, while calling on the public to be vigilant. The statement reads; “The general public is please requested not to panic and discountenance rumours of Boko Haram presence. “You are further enjoined to please remain at home and be vigilant. The security situation in Maiduguri is under control”.